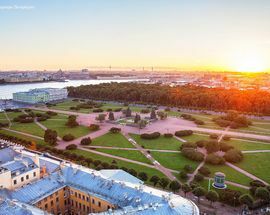 Founded by Tsar Peter the Great on 27 May 1703, St. Petersburg was the capital of the Russian Empire for more than two hundred years (1712–1728, 1732–1918). 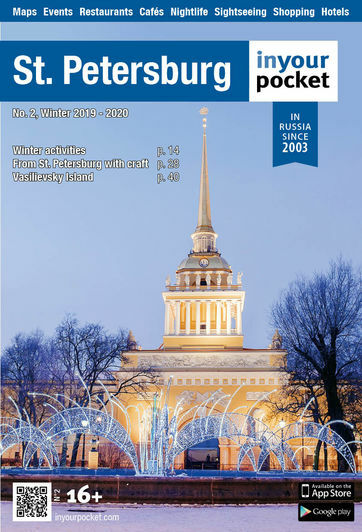 The new city's first building was the Peter and Paul Fortress, which originally also bore the name of Sankt Pieterburg, was laid down on Zayachy (Hare's) Island, just off the right bank of the Neva. The influence of Peter the Great on the city cannot be underestimated and by following this route you will find out many interesting facts about St. Petersburg from the times of the great Tsar. 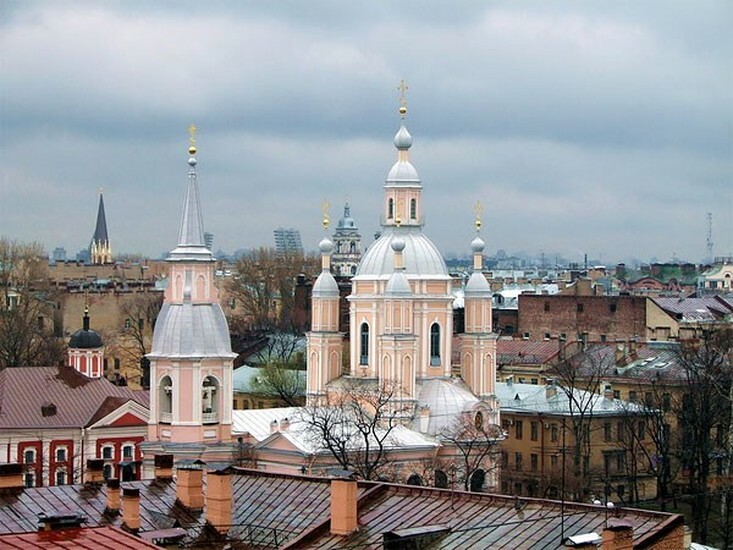 St. Andrew’s cathedral is the last of the Baroque churches to be built in St. Petersburg. Peter the Great himself commissioned the construction at this site in name of St. Andrew whom he considered his own personal protector. At first it was a primitive wooden structure, which would later burn to the ground after being struck by lightning. Redesigned in stone, the project was further delayed by the collapse of its cupola. As if that wasn’t enough violence, many of its valuables were confiscated by the Bolsheviks in 1924 despite the attempts of several hundred believers to protect the icons held inside and was closed down entirely in 1938, following the arrests of St. Andrew’s priests and the destruction of its bells. The cathedral you can see today then had to undergo massive reconstruction following artillery damage done during World War II. To be fair, it did have defensive cannons mounted atop its dome at the time. It returned to the hands of the Russian Orthodox Church in 1992, complete with two 18th century icons of its namesake. Now a fully functioning place of worship, you can view services, light a prayer candle and view its famous iconostasis all at once. The Menshikov Palace on Vasilyevsky Island was one of the very first buildings in St. Petersburg. The palace was founded in 1710 as a residence of St. Petersburg Governor General Alexander Menshikov. Many western European architects and craftsmen were involved in the project, including Francesco Fontana, Johann Gottfried Schädel, Domenico Trezzini, Carlo Bartolomeo Rastrelli, Georg Johann Mattarnovy and Jean-Baptiste Leblond. It was opened in 1711, but the construction continued until 1727, when Menshikov with his family was exiled to Siberia and his property was confiscated. In 1731, Cadet Corps were established and occupied the palace and neighboring buildings. 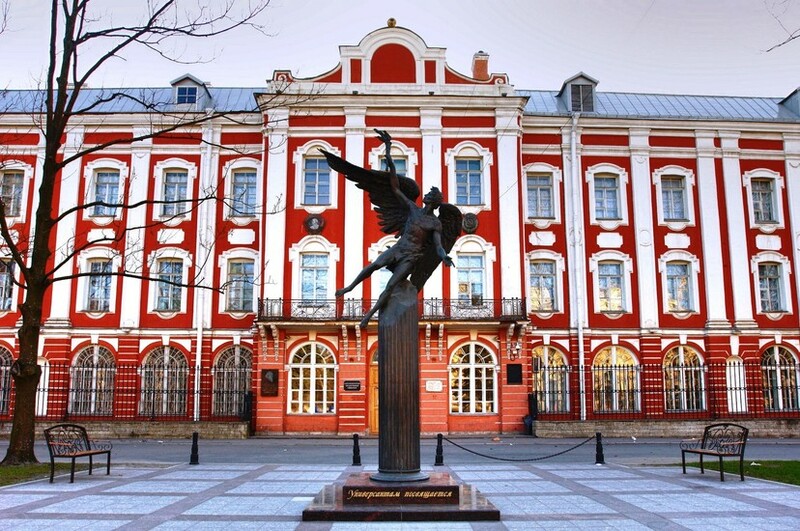 At the end of the 19th century the Menshikov Palace was restored and became the Museum of the Corps. It's now a branch of the Hermitage and the beautifully decorated rooms display early 18th century art, as well as some of Peter's work-tools. The Twelve Collegia, or Twelve Colleges, is the largest edifice from the Petrine era remaining in St. Petersburg and consists of twelve identical three-storey sections. At different times, the building housed the supreme apparatus of state administration — collegia, and later the Pedagogical Institute and St. Petersburg State University. It was designed by Domenico Trezzini and Theodor Schwertfeger and built from 1722 to 1744. The three-storey, red-brick complex of 12 buildings is 400–440 meters long, giving an illusion of one enormous edifice. The result is an "austerely structured" complex with a "rustic style". The original design separated the 12 individual buildings. In subsequent restructuring, they would be connected to form the modern complex. Presently, the Twelve Collegia serves as one of three Petrine Baroque structures for St. Petersburg State University. Even now, some faculties of the University are located in the building of the Twelve Collegia. The building is also home to the “Peter Hall”, in which regular concerts for the general public are held. Today Troitskaya Ploshchad is a comparatively empty and unremarkable green space. Three hundred years ago, however, the square was bustling with activity. 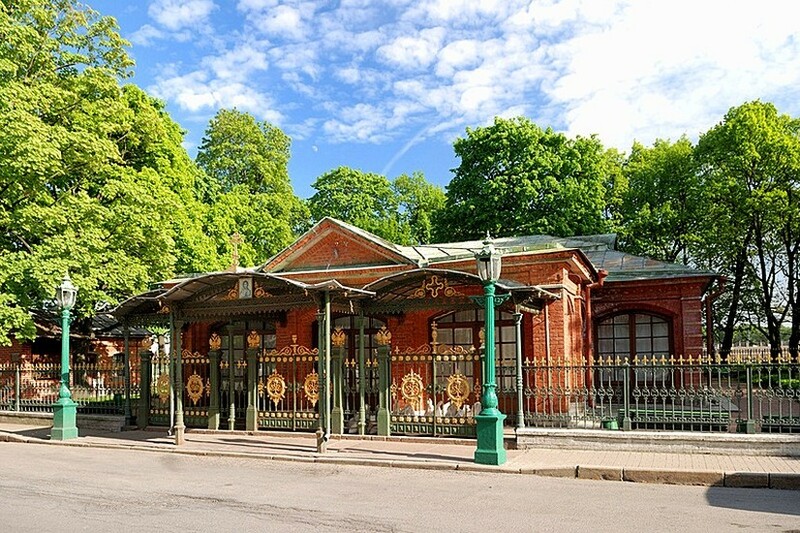 In the shadow of the Peter and Paul Fortress, the first buildings of the new city of St. Petersburg sprung up one after another: the first Gostiny Dvor, the first pharmacy, the first post office and the first printing press, as well as the first municipal market. At the center of the square, Domenico Trezzini designed the wooden Troitsky (Trinity) Cathedral. For a long time it was the main cathedral of the St. Petersburg. The square was also used for the reading of royal decrees and for a variety of festivals and military parades. The most noteworthy of which took place on October 22, 1721 when Peter was declared the first Emperor of Russia at this site. After that, however, the area started to lose its significance. 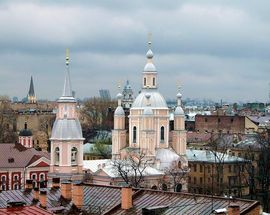 The port and the administrative center of the city moved to Vasilievsky Island, and during the 1720s and 1730s fires destroyed almost all of the buildings on Trinity Square. The Trinity Cathedral was the only one to be rebuilt in 1756 - this time in stone. Eventually, life on the square continued in its normal rhythm and many celebrations, firework displays, military parades and public executions took place here. 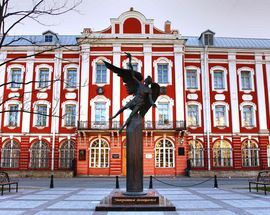 The first residential building to be built in the newly founded city of St. Petersburg was a wooden house or cabin, intended for Peter himself. Although the cabin is very small (only 60 sq. meters in area), Peter lived in this house between 1703 and 1708. Peter the Great wanted all the houses of his new city to be built of stone, the way it was done in Europe. But he could not afford a stone house at the time, so he ordered the walls to be painted as if the house was made of bricks. It is now open to public and the living room, bedroom and study are still filled with Peter's original belongings, bearing the mark of his presence. For example, you can find his uniform made of red woolen cloth; a pipe of boxwood with agate insets (a present from A. Menshikov); an Oriental-style cane covered with sea skate skin; a small boat built by Peter himself which he used it to cross the Neva River; and an armchair made of pear tree wood, which, legend has it, was built by Peter himself. Across the river from the Peter and Paul fortress and the wooden Cabin of Peter the Great you can visit the historical Summer Garden. 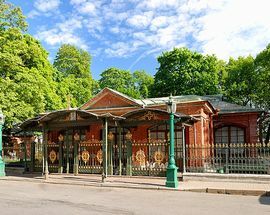 Behind the beautiful wrought iron fence there is an old park that has witnessed some of the most spectacular moments in St. Petersburg's early history. Impressed by the royal parks that he had seen in Europe, Peter was very keen to create something similar in his newly built "Venice of the North". In Peter's new park everything was created according to the latest fashions; the trees and bushes were trimmed in the most elaborate way and all the alleys were decorated with marble statues and fountains. Peter used to organize regular receptions and balls in the gardens, his "assamblei", which involved dancing and drinking and impressive firework displays. Peter commissioned the city's first and foremost architect, the Italian Domenico Trezzini, to build a small palace in the park. The palace had no heating and was intended only for summer-time use, hence its name "Summer Palace", as opposed to the "Winter Palace" that Peter had built just down the same embankment of the Neva. The Summer Palace, a small two-storey yellow building, was built between 1710 and 1714, with 7 rooms on each floor. After the Second World War the palace was carefully restored, the older interiors were recreated and a collection of early 18th century artifacts, many originally owned by Peter the Great, was put on display. The Summer Garden occupies an island between the Fontanka, Moika and the Swan Canal. It shares its name with the adjacent Summer Palace of Peter the Great. 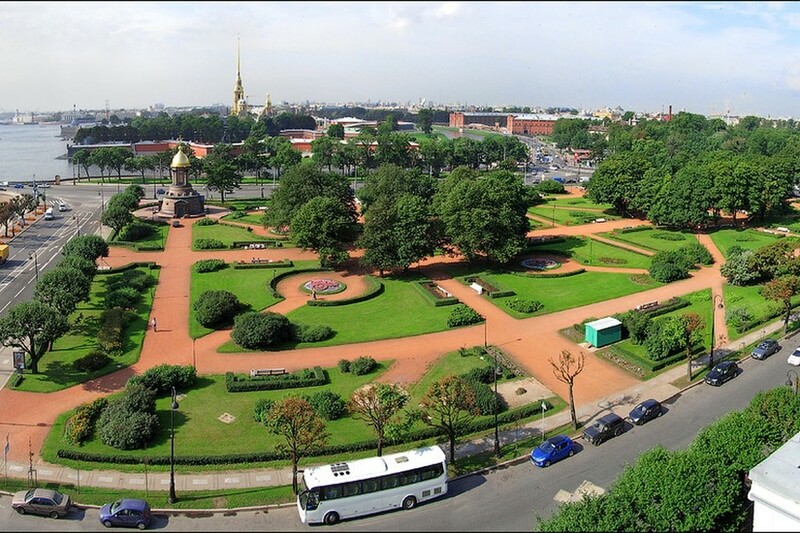 The park was personally designed by Peter the Great in 1704, supposedly with the assistance of the Dutch gardener and physician Nicolaas Bidloo. Starting from 1712, the planting of the Summer Garden was further elaborated by the Dutch gardener Jan Roosen, who was the chief gardener of the park till 1726. 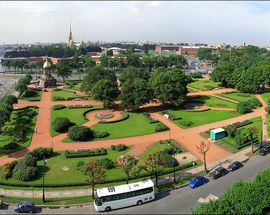 The well-known French architect Jean-Baptiste Le Blond, who arrived in St. Petersburg in 1716, added to the park the flavour of a Garden à la française. The Summer Garden was largely completed in 1719. The walks were lined with a hundred allegorical marble sculptures, executed by Francesco Penso, Pietro Baratta, Marino Gropelli, Alvise Tagliapietra, Bartolomeo Modulo and other Venetian sculptors that were acquired by Sava Vladislavich. In the late 20th century, 90 surviving statues were moved indoors, while modern replicas took their place in the park. The sequence of patterned parterres, originally more formal than the current landscape, were the site of Imperial “assemblies”, or lavish parties which often included balls, feasts and fireworks. Apart from the statuary, a major park attraction were the fountains, the oldest in Russia, representing scenes from Aesop's fables. Some of these fell out of use and were demolished after the 1777 inundation which destroyed the fountain machinery acquired by Peter in Britain. A delicate iron-cast railing, separating the park from the public walk of the Palace Embankment, was installed between 1771 and 1784 to a design by Georg von Veldten. The grille is suspended between 36 granite columns crowned with urns and vases. The poet Anna Akhmatova, among others, considered the grille to be a pinnacle of art-casting and one of the symbols of St Petersburg. The park was chosen by Alexander Pushkin as a setting for childhood walks of the fictional character Eugene Onegin. Today, the park remains one of the most romantic places in the city. 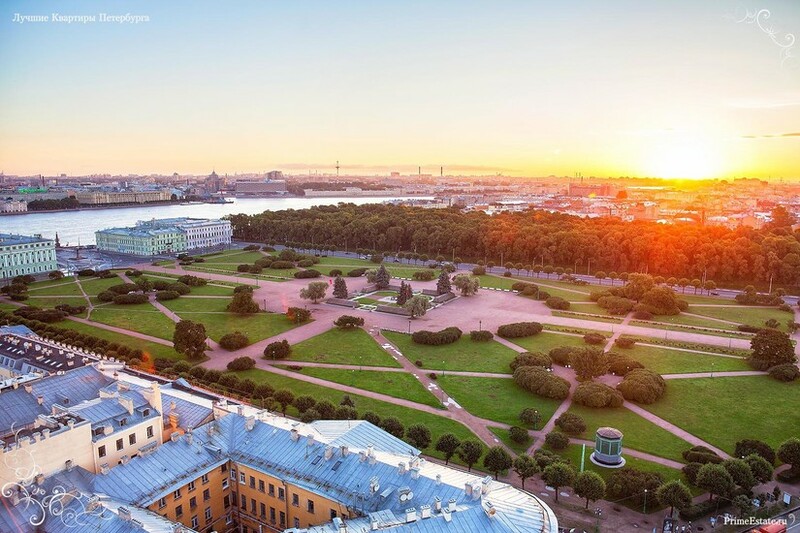 Named after Mars, the Roman god of war, the history of Field of Mars goes back to the first years of St. Petersburg. At that time it was called the Great Meadow. Later it was the setting for celebrations to mark Russia's victory in the Great Northern War and the field was renamed the Amusement Field (Poteshnoe Pole). In the 1740s the Amusement Field was turned for a short while into a walking park with paths, lawn and flowers. Its next name – Tsarina’s Meadow – appears after the royal family commissioned Rastrelli to build the Summer Palace for Empress Elizabeth. But towards the end of the 18th century, Tsarina’s Meadow became a military drill ground where they erected monuments commemorating the victories of the Russian Army and where parades and military exercises took place regularly. In 1799 the Rumyantsev obelisk was placed in the centre of the Field and in 1801 a monument to Alexander Suvorov by Mikhail Kozlovsky was placed on the south side. The great military leader was depicted as Mars. In 1805 the Tsarina’s Meadow was officially renamed the Field of Mars. The Rumyantsev obelisk was removed to Vasilyevsky Island in 1818, while at the suggestion of Carlo Rossi the monument to Suvorov was resited on Suvorov Square alongside the Field of Mars. After the February Revolution in 1917 the Field of Mars finally lost its significance as a military drill ground and became a memorial area, used to bury the revolution's honoured dead. In summer 1942 the Field of Mars was completely covered with vegetable gardens to supply the besieged Leningrad. On 6 November, 1957 an Eternal Flame was lit in the center of the Field, becoming the first such flame in Russia. From here, the Flame was delivered to Moscow in 1967 and was placed near the Kremlin wall on the Tomb of Unknown Soldier. The Flame from the Field of Mars also burns on Piskaryovskoye Memorial Cemetery and on other memorials in Saint-Petersburg. During the reign of Peter the Great, the tsar was obsessed with forming a strong navy. Because Russia only had one seaport in the far north, he believed it necessary to build another. Thus the Admiralty began its life as a fortified shipyard in 1704. The original stone Admiralty building was erected in 1719, and this marked the first appearance of the Admiralty Spire with its ship weathervane, which was to become one of the most recognizable symbols of St. Petersburg. The building now standing, with its magnificent 400m facade facing the Alexandrovsky Garden and its massive wings embracing three blocks along the Admiralty Embankment (Admiralteyskaya Naberezhnaya), took 17 years to build and was completed in 1823. It was the masterpiece of architect Adrian Zakharov, who executed the building in the high classical style of Russian Empire. When the shipyard was opened, it employed some ten thousand men working hard to produce an abundance of ships. It wasn't unusual to see Peter himself at the shipyard on various occasions as he was considered a master shipbuilder, carpenter and designer. Located at the western end of the Nevsky Prospekt, The Admiralty with its gilded spire topped by a golden weather-vane in the shape of a small sail warship (Korablik), is the focal point of old St. Petersburg's three main streets - Nevsky Prospect, Gorokhovaya Street, and Voznesensky Avenue - underscoring the importance Peter I placed on Russia's Navy. Vladimir Nabokov, writer and native of St. Petersburg, wrote a short story in May 1933 entitled "The Admiralty Spire". 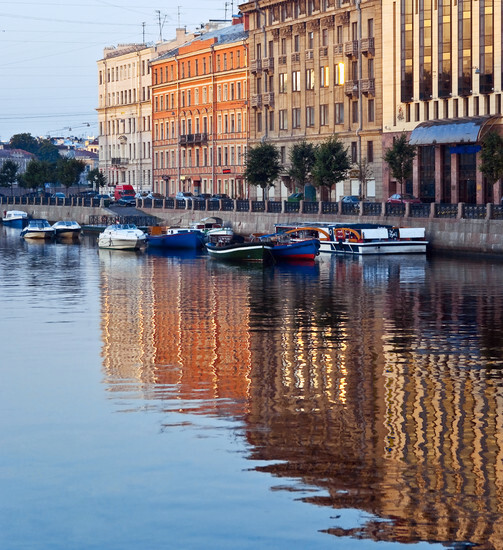 St. Petersburg’s famous Fontanka River, one of 93 rivers and channels in St. Petersburg, was once named “Anonymous Creek”. The river got its present name in 1719 because its waters supplied the fountains of the Summer Garden. 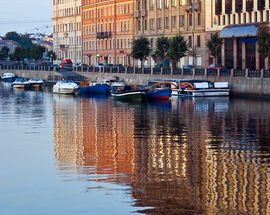 Until the mid-18th century, the Fontanka River was considered the southern boundary of St. Petersburg. Its banks were lined with the spacious messuages of Russian Imperial Family members and nobility, the most brilliant being the Summer Palace and Anichkov Palace. Among the relics of Baroque architecture along the banks of the river are the Sheremetev Palace, Beloselsky-Belozersky Palace, Shuvalov Palace, and the Church of St. Panteleimon. The notable Neoclassical structures from the 18th century include the Catherine Institute, the Anichkov Palace and the Yusupov Palace. Some of the mansions contain museums of those writers and composers who lived there: Gavrila Derzhavin, Alexander Pushkin, Ivan Turgenev, Anna Akhmatova and others. At the very end of Shpalernoi Street one Baroque style building stands out from the rest. This is Kikin Hall, one of the oldest building in the city. Historians are still unsure of the architect who designed it, but similarities to the old Peterhof palace are striking, suggesting that it may have been Andreas Schlüter. Initially, the building was the intended residence of Alexander Kikin, the man in charge of the Admiralty Shipyard. However, the palace was not completed in time for him to live there: Kikin fell out of favor with the crown and was executed in 1718. The building was subsequently used to house the royal library and the cabinet of curiosities of the Academy of Sciences (later transferred to the Kunstkammer Building). At some point in the 1720s the original two-storey residence was expanded and the third storey was added. After 1733 the building was occupied by the office of the Horse Guards and their hospital. The building suffered very serious damage as a result of heavy aerial bombardments during the Second World War but, luckily, Irina Benois (from the famous Benois family) restored the building to its presumed Petrine Baroque appearance between 1952 and 1956. Today, Kikin Hall is home to a music school.